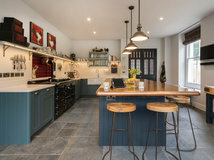 The kitchen and dining area at the back of the property were originally much smaller, and felt dark and disconnected from the living spaces. 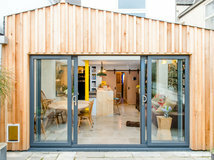 The new kitchen was designed bespoke by Mustard Architects and handmade by a joiner. 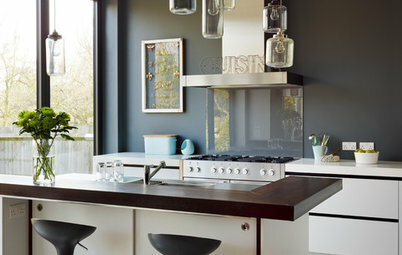 It combines stained birch plywood cabinet fronts with stainless-steel worktops, and has an integrated sink for a seamless finish that has a distinct urban-industrial look. 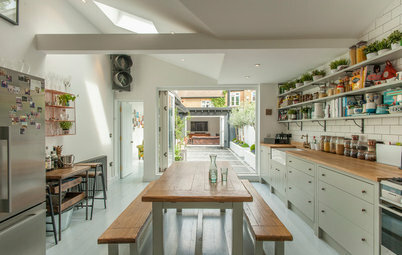 Kitchen joinery, Hexagon Furniture. 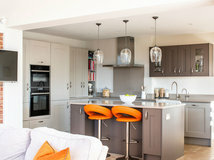 Worktops, MPN Engineering Services. 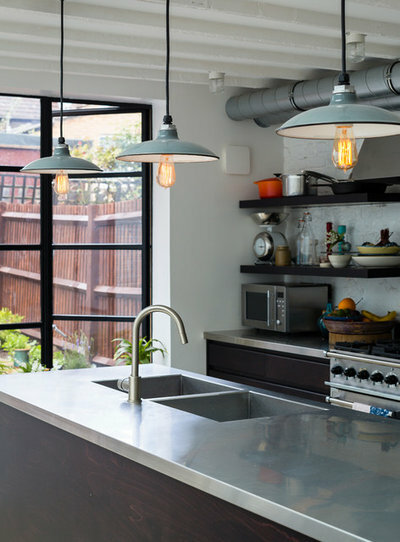 Pendant lights, Barn Light Electric. 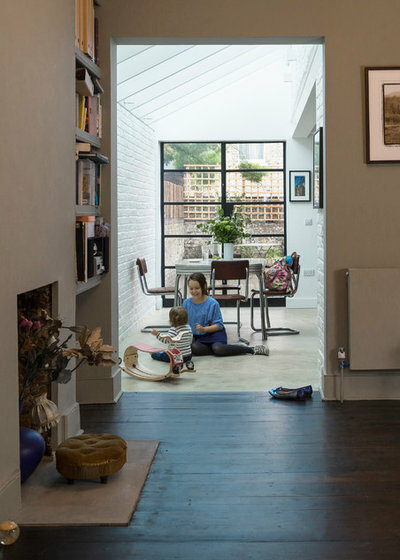 Norman opted for exposed ductwork because it enhances the industrial vibe of the space. 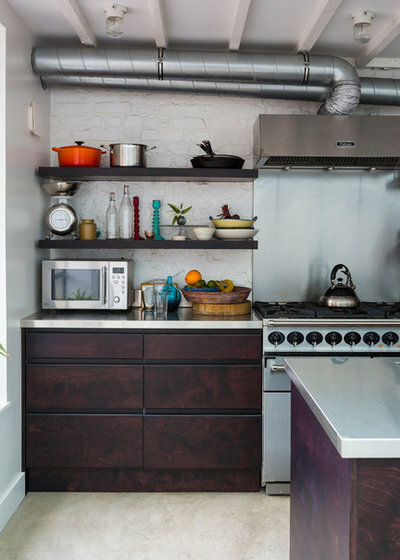 “We used off-the-shelf rigid metal ductwork, which the contractor installed on site,” he says. Range cooker and cooker hood, Falcon. 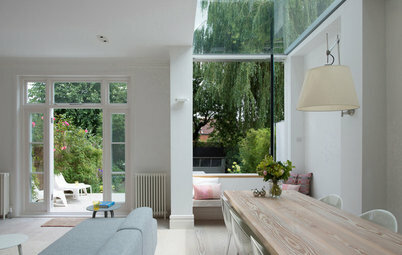 A glazed roof was a key requirement of the clients’ brief and part of the design from the beginning. “We had to work closely with the builder to discuss how the new structure would integrate with the old,” Norman explains. The clients wanted to expose the existing floor joists above the main kitchen area to create an interesting ceiling feature. 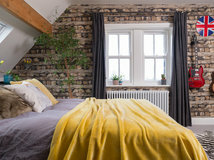 All the exposed brickwork and beams were then simply painted white. 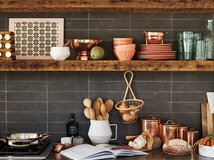 This not only kept the costs down, it also helped to achieve a textured industrial backdrop without too much fuss. 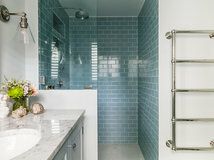 “The paint worked to unify all the different materials while keeping their raw finish,” the architect adds. 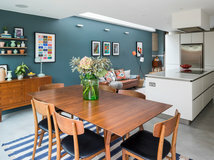 The retro-style dining table and chairs were picked up from a second-hand shop by the clients while they were living in New York. 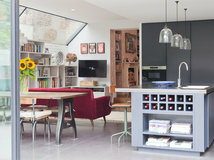 The architect chose a concrete floor to add to the raw, industrial feel of the space. 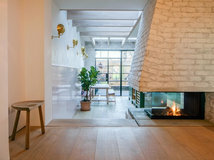 “It’s a power-floated concrete floor, which involves a high-speed mechanical process of trowelling the concrete to leave a smooth and level finish, which we left untinted and treated with a satin sealant,” says Norman. The openings between each room were widened and kept free of any doors to allow as much light as possible to filter through. 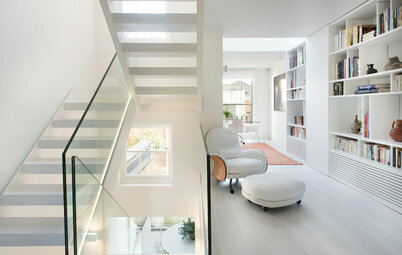 It strikes a balance between modern, open-plan living and traditional, individual rooms. 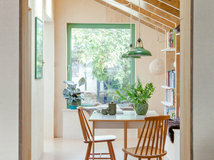 “The house has a fairly straightforward, open layout on the ground floor,” says Norman. 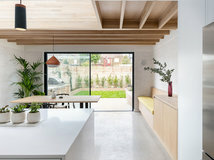 “We created a procession of spaces, from the front living room through to the rear living room [in the middle of the house] into the kitchen-diner and out into the garden. 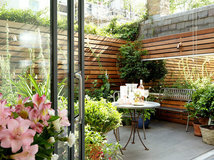 “There’s an awesome sense of space and light that hits you when moving from the front of the house to the rear. 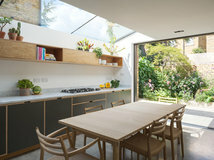 When in the dining space, you have a view out to the garden, back to the living room, across to the kitchen and up to the sky and, at night, the stars,” he adds. 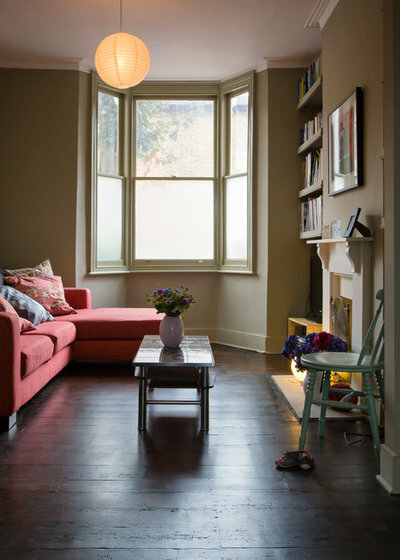 The front living room has a simple edit of furniture. 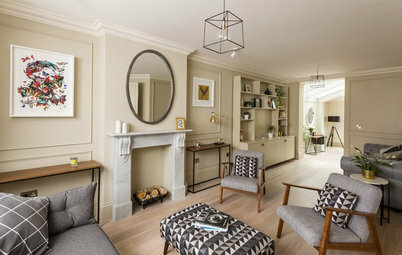 “We closed off direct access to the front living room from the hallway to make it an end destination, accessed from the middle of the house, and to improve the furniture layout,” says Norman. 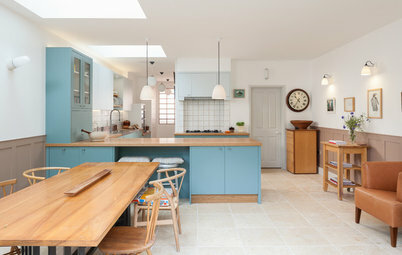 The existing floorboards were sanded back and stained, and now echo the stained cabinetry in the kitchen. 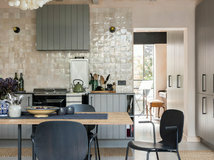 “The wall colours were chosen to contrast with the bright, light kitchen space and respond to the traditional nature of the house,” Norman adds. Paint, Colour Makes People Happy. 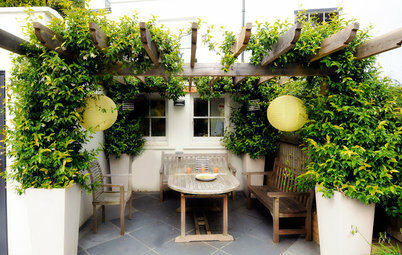 The rear doors and windows were previously white uPVC double-glazed units and a long way from what the clients desired. 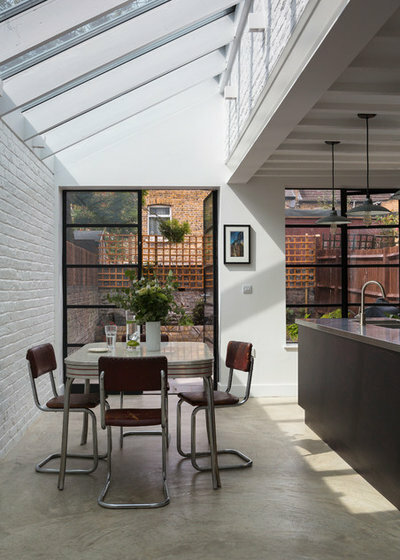 They were replaced with low-profile, Crittall steel frames in keeping with the industrial feel of the rest of the space. “Conventional aluminium frames, doors and windows would have likely had frames at least double or even three times the width,” says Norman. 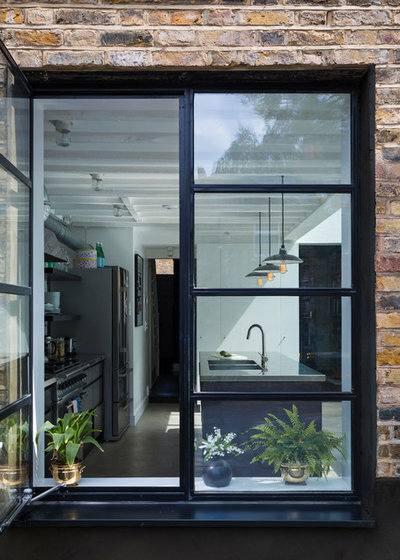 Crittall doors and window, Metwin. 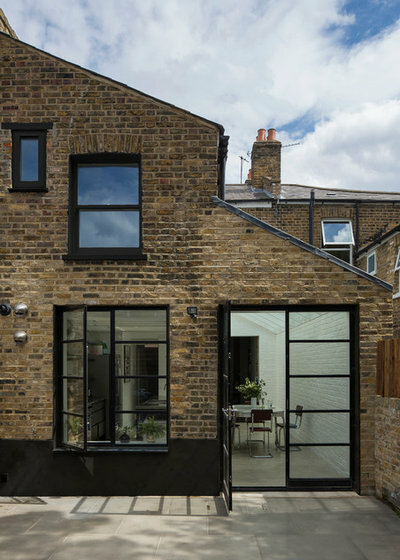 The back of the house merges traditional architecture with the industrial-style, low-profile glazing bars. 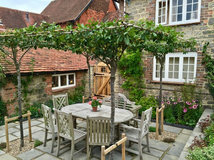 What do you think of this extension? Share your thoughts in the Comments below. I love it all, but I like most the glass ceiling. By the way, how is the maintenance or cleaning? How do you deal with hot sun? 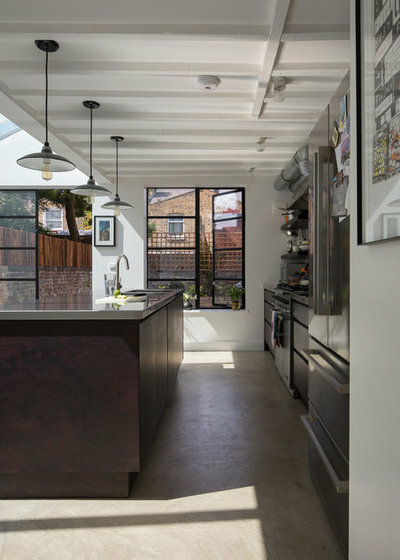 I am replacing the back patio doors and kitchen window in my Georgian house and have chosen the crittall style like these. I have contacted Crittall but their waiting time is 6 months. Are there any alternatives with the same look? I really like all the areas of your home.